A view of Jind with a small native encampment before it, and a great termite heap. bl.uk > Online Gallery Home	> Online exhibitions	> Asia, Pacific and Africa Collections	> A view of Jind with a small native encampment before it, and a great termite heap. 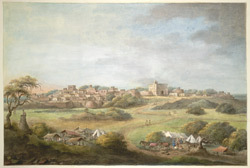 Watercolour of view of Jind from 'Views by Seeta Ram from Mohumdy to Gheen Vol. V' produced for Lord Moira, afterwards the Marquess of Hastings, by Sita Ram between 1814-15. Marquess of Hastings, the Governor-General of Bengal and the Commander-in-Chief (r.1813-23), was accompanied by artist Sita Ram (flourished c.1810-22) to illustrate his journey from Calcutta to Delhi between 1814-15.